HaT French Wagon converted into one for WWII Germans. This Napoleonic wagon has had the canvas cut back and a seating area added to update the wagon. I have seen photos of French wagons in German service in WWII and they look like this. This is part of my Indian Legion unit, non-German troops often got older equipment so I think this works well for them. They served in France but since I have no photos of their wagons, this seems logical. The figure is Revell German Artillery with a turban head from Atlantic Indian Army. The green guy is a HaT German Horse Cavalry figure. Flak tower in the rear. 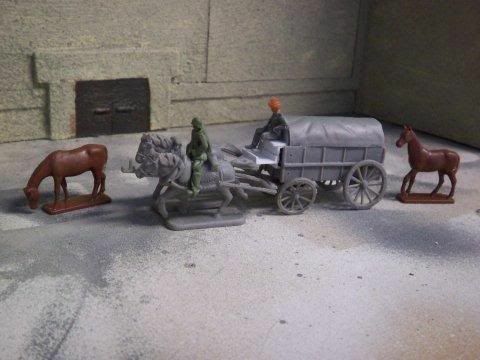 A pair of Atlas HO scale brown horses as extra horses. Horse drawn units often had extra horses who would be rotated in and out of the team after a bit of rest. A horse wagon gets hit and you have an extra team. This wagon has had the front canvas cut down and styrene channels and Ls glued on to create a seat and foot rests. 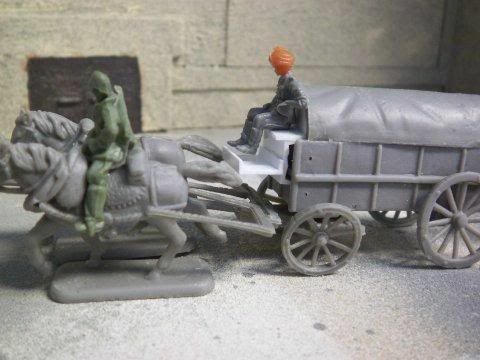 A Hat WWII German soldier is riding the horse and a Revell WWII German Artillery with Atlantic Indian Army head is seated on the seat of the wagon. Part of my Azad Hind unit. The Germans used many captured French wagons and they look just about like this. Since non-German units often got older equipment I have given them these French wagons and WWI era German artillery from Hat. Many thanks to Mr. Creek. All rights reserved www.hat.com and www.hat72.com. Any unauthorized or commerical use of content or images are violations of applicable laws and will be prosecuted to the fullest extent of the law. Any trademark usage or proprietary images on this page are only for the purposes of review or such, and is considered fair dealing and permissible under the Copyright, Design and Patents Act, 1988 (UK). Copyright 2007.